This is a bit of worrying in advance but best that than not to care at all! OK so I have had puppies before, I had dogs when I was younger and have helped friends raise very nice dogs too. 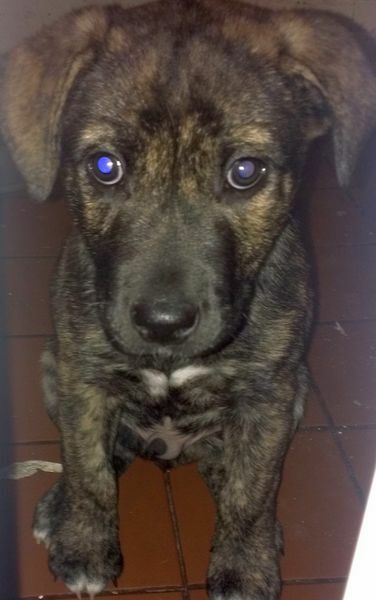 This time is a little different as the puppy has a) a breed in the mix which I am unused to (he is staff x husky x lab) and b) he needed to be rehomed at 5 weeks - please read on before telling me off as I would scold anyone else who did such a thing! I used to own his father but I needed an operation on my legs and couldn't look after him, but I absolutely love the mix of lab and husky, they are energetic and wonderful while being slightly more obedient off lead. I had already told my friend who was looking after my old dog plus her staffy that if they had pups I would want one, and as there was only one male and I only ever have male pups it was a clear choice which would be mine. Only thing is by 3 weeks he had to be almost totally weaned because of his size compared to his mum and littermates, and by 5 weeks he was bullying his 2 sisters so badly they couldn't be kept together at night- he was twice the size of the runt. Me and Jules made the decision that all he was going to learn from them was how to be a bully and they were getting really scared of him. I took him home and have been very kind-but firm about the dominance, he is now 8 weeks old, he doesn't bite he doesn't display any dominant behaviour, he sleeps in the kitchen without whining and he wouldn't dream of doing his doo's anywhere other than his paper or outside. Basically he knows he is loved and is comfortable, and he is obviously very bright. SO, I just wondered if anyone has any tips when it comes to re-intergrating with other dogs? I have lots of friends with dogs who I can arrange one on one outings with, or little dog parties in the park. First of all, I wouldn't arrange any outings with other dogs until he has had his shots. Then I would start off slowly with one on one play dates with a pup his own size. I'm sure others will come along with more current experience and suggestions. I haven't had a young puppy in years. Looking forward to pictures. He had his first shot at 7 weeks and his next shot is in a few days so he cant meet any dogs just yet, just wanted to get as much advise as possible before that time. And in response to Bigboy - he was fighting the other pups away and due to his size this was becoming a problem so he had to be fed separately, and the mother started to reject him. The runt of the litter had actually stopped breathing not long after being born and Jules managed to bring her round, and from then on it was always a bit of a battle to make sure the 2 smaller pups got fed. And then the point about the other pups warning him about his roughness - he was totally ignoring their screaming when he was biting them and if they tried to fight him off he would just dominate them. 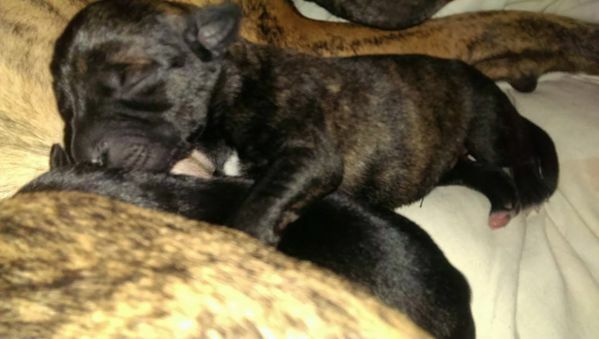 It got to the point that they couldn't be left together unsupervised, we both thought that actually all he was learning from that was how to be fighty and dominant and unpleasant, and removing him from the situation and re-integrating him later with pups his own size would be more beneficial. My apologies re his age thought he was under 7 weeks old I would seriously train using N.I.L.I.F (Nothing In Life Is Free) there are plenty of threads on here about this training method which is kind and positive and works Basicaly everything is on your terms and not the dogs wether it's feeding him, letting him greet other dogss/people etc,etc it covers all aspect on dog training. You can also Google NILIF is you prefer You may know already staffies are very strong willed and therefore need a strong minded leader in return but through kindness and discipline you can get a great dog if you put the time and effort in Obienence classes too could help with dogs of a similar age/size! Good luck! and keep us updated please. Dunbar'sMom has given you good advice. Limit his interactions to those where you can control his behavior and environment until he has completed his shots. Then look into a supervised puppy class and allow him to be introduced slowly. remove the paper as this is probably sending out mixed signals to him saying it's ok in as well as outside BTW have you given him a name yet?